In comparison to some of the more well known names in relationship simulations such as Tokimeki Memorial and Doukyuusei 2, Sister Princess may not have that special touch that would have make it last in terms of popularity. But in the first month after it's release in the first half of 2001, it was a more desirable title than most new games at the time, with game stores in many parts of Asia having a hard time keeping it in stock. The price for a copy of the game peaked at around 170% of it's original retail price at one point. 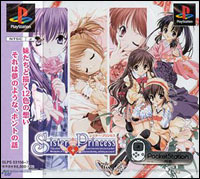 Like all other relationship simulations, Sister Princess also carries multiple endings, according to the actions the player took during the course of the game. The biggest difference would be that in Sister Princess, each female character carries not just one, but two entirely different endings - a 'blood related relationship' ending and a 'non-blood related relationship' ending. As the name implies, 'blood related relationship' endings can be obtained through regular, formal converstions as brother and sisters. On the other hand, a 'non-blood related relationship' ending in this game can only be obtained through interactions between the player and the girls featured in the game that resembles more of a 'Kareshi / Kanojyou' relationship. A special ending with a suprising twist will be introduced to players who manage to finish the game on the 'non-blood related relationship' end, an objective that is relatively hard to reach without the help of a strategy guide. It was precisely these special 'non-blood related' endings that put Sister Princess in the spotlight when it was first introduced in Japan. 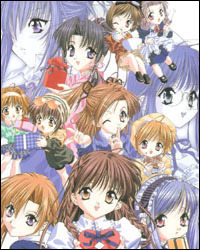 Unlike the field map, time clock system employed by Doukyuusei 2 or the number system in Tokimeki Memorial, the system used in Sister Princess is as simple as it gets. After the first few demo actions forced upon the player by the game, players will be allowed to pick what they want to do in three different time periods in each day starting from February 11th through March 14 (the ending date of the game may vary depending on which of the female characters the player finishes the game with) - first is the free time period before noon, then is the period after lunch and the free time period before bed. During day time, player can choose which of the girls they wish to walk to school with (or go by yourself). The period after lunch is similar to the one in the morning, with additional choices which allows the player to go to various places in town besides walking home with one of the girls. Every night before bed, the player will be allowed to check e-mails on the computer and write replies. According to the replies the player gives during the game (answers to questions the female characters may ask can vary from two answers to seven), reactions among the girls to the player's presence and what the player says will change as the game goes on, eventually leading to one of the endings. The only advantage the player will get by playing Sister Princess versus playing other relationship simulations, is that you will be the only male in the game. You will be the center of attention whether you like it or not. Players will also be able to access the Omake features which include the Pocket Station games ("Luck Predictions" and "Who's Voice was it? "), BGM gallery and the CG gallery. If you are interested in kawaii (cute) characters and relationship games and that you are SURE you can take the annoyance of being the center of attention around the clock, this will be a good bet. However, if you have no experience in reading or listening to Japanese, you will be wasting your money, because you are not going to catch anything they say or do in this game, you are only going to feel frustrated and annoyed after playing it.